At any given moment in time, governments in the United States and around the globe are carrying out key missions in service of their citizens, learning from and engaging with partners in other sectors, and acting as cost-effective stewards of public resources. The countless positive daily actions of government leaders go largely unrecognized amidst a constant focus on the highly visible but far smaller set of challenges and problems faced by the public sector. However, stepping back to view progress over a span of decades reveals evidence of the sum total of this continuous evolution in government management—as well as providing perspective on the future of public service. 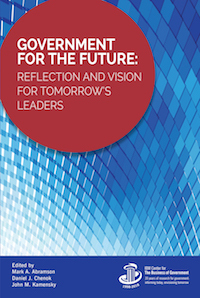 It is from this longer-term perspective about the performance and potential for government that the IBM Center for The Business of Government wrote the book being released today, Government for the Future: Reflection and Vision for Tomorrow’s Leaders. For 20 years since 1998, the IBM Center has published research from more than 400 outside contributors—largely from academia, as well as nonprofits and journalists. Collectively, these contributors created a body of knowledge about best practices and lessons learned for government improvement. In addition, the IBM Center has developed a record of public sector challenges and opportunities through more than 500 interviews with government lead­ers on its radio show, the “Business of Government Hour.” In Government for the Future, we draw from this rich repository of content to reflect on major drivers of public sector progress over the past two decades. More importantly, reflection on this content provides a foundation to paint a vision of what government management may look like two decades hence. The book builds on this foundation to bring together a set of viewpoints about the public sector in 2040. This vision of tomorrow’s government is framed through essays from experts that lay out a roadmap for how to maximize benefits and mini­mize risks, with potential innovations ranging from the workplace of the future to the advancement of space exploration. What does the implementation of management reform over the past 20 years teach current and future government leaders about how to proceed with these and other management reforms in the future? The book finds that several common themes emerge from analysis of past management trends. • Management reform is not for the faint-hearted. Management reform requires major commitment and staying power. In short, it’s not for the timid or those with short time horizons. It takes a well-executed implementation plan and top-level commitment. • In launching management initiatives, government leaders should target key goals and not overload the “system” with too much reform concurrently. Successful change leaders in government are selective about which management initiatives to launch. • Successful management initiatives require much time and effort, and a focus on implementation. While less successful initiatives launched over the last 20 years may have been sound conceptually, many suffered from poor execution. • Effective leadership makes management initiatives succeed. While it has become a cliché, leadership from the top drives success in launching a management initiative. Based on lessons learned from the past and the research done for our new book, an outline of a vision of what government might look like in 2040 comes into focus. We see two sets of developments evolving. First, technology will drive the redeployment of resources—people, dollars, and organizational structures. Second, as a consequence of these technology changes, the way people work and interact will change, and this will reframe how government works—including service delivery, citizen involvement, and different business models. • Artificial and augmented intelligence (AI) will change the game. Advances in the use of AI will change roles, both within government and between government and citizens. • Data will drive progress. The increased availability and use of data will reframe how government managers use knowledge and insight to analyze performance, make decisions, and deliver services. • Government services will become platform-based. In this scenario, government will be more of a facilitator, creating the conditions for platforms that could be built in the private and nonprofit sectors collaborating with the public sector. • Government will be more citizen-driven. Government in 2040 will be more citizen focused, with people leveraging technology and data to interact with their government. • Government will become more network-based. The role of government workers evolving within a network-based environment as a result of technology will change, becoming flatter, more open, and more collaborative. • Volunteer participation with government will increase. Citizens will have more time to spend on volunteer activities in 2040—either as retirees or members of a 2040 workforce that benefits from technology. For 20 years, the IBM Center has been privileged to contribute cutting-edge research that led to practical, actionable recommendations for government executives, and to have collaborated with like-minded organizations to improve government performance. With Government for the Future, we look to continue this collaboration among government, academia, nonprofits, and industry through the next twenty years. We hope that the perspectives provided throughout this book help leaders make this positive vision for government into tomorrow’s reality.